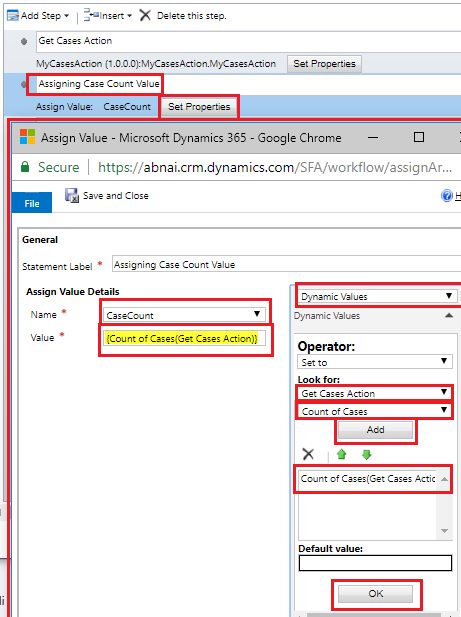 In this article, we will learn how to create Custom Actions for Dynamics 365 with C#. 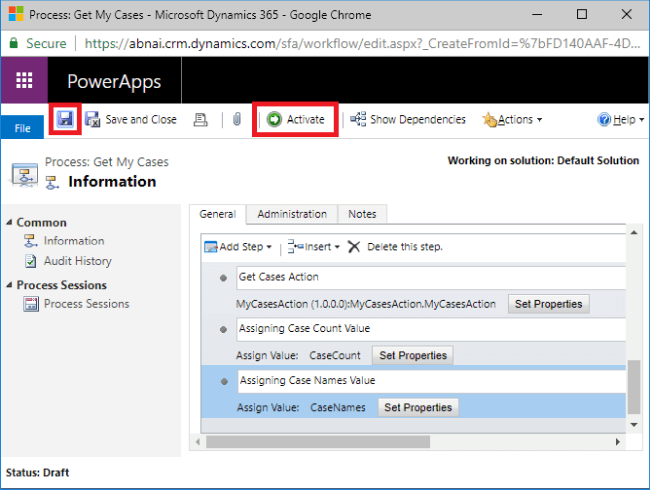 Custom Actions are lesser used processes than Workflows and Plugins in Dynamics 365, but very useful also at the same time. For people who have already have an idea of Custom Workflow Activity (or read my previous article), it’s going to be very easy. The coding part is the same, only "how we consume the code in Dynamics 365 process" is different, and use cases too, obviously. Custom Actions can be created with or without writing code, but they can be triggered only by the code. Here, we will write custom code to retrieve the case records assigned to calling users. 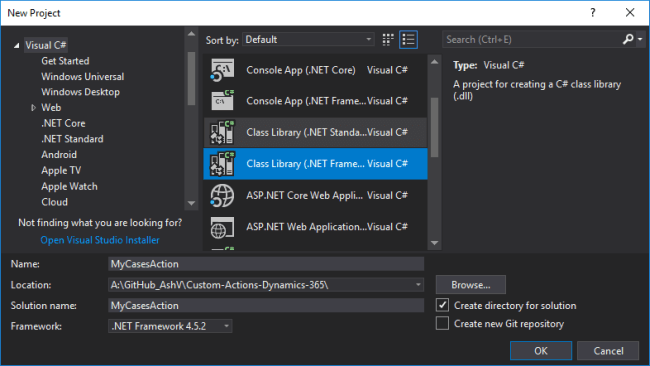 In Visual Studio, create a new project of type Class Library & select framework version 4.5.2. This might change for future versions. I have given the name as MyCasesAction, which tells the purpose of the workflow. Go to Manage NuGet Packages and install Microssoft.CrmSdk.CoreAssemblies (for Microsoft.Xrm.Sdk namespace) & Microssoft.CrmSdk.Workflow (for Microsoft.Xrm.Sdk.Workflow namespace). Create a class MyCasesAction inherited from CodeActivity. It will need to add System.Activities namespace. We will have 2 output parameters - one containing count of cases, the other having the name of cases separated by commas. We will take the user’s GUID from context. On the left pane, click on Signing. Check "Sign the assembly" checkbox. "Create Strong Name Key" popup will appear. Optionally, you can protect this key file with a password. 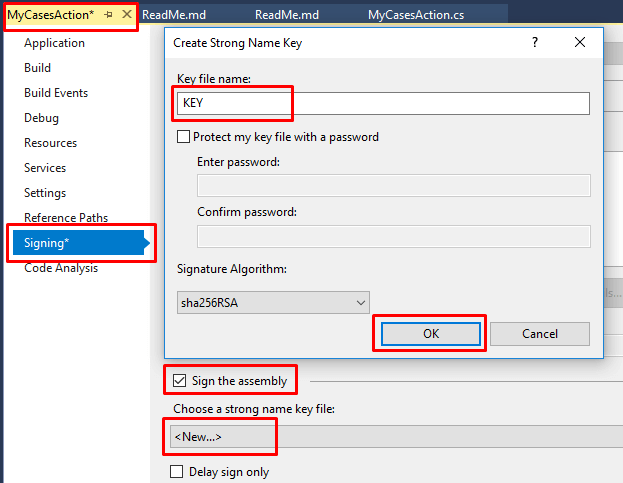 Click OK to generate the key and sign the assembly. Open the Plugin Registration Tool and connect with your organization. If you don’t already have it, grab it by adding Microsoft.CrmSdk.XrmTooling.PluginRegistrationTool NuGet Package. Click on Register, then Register New Assembly. Register New Assembly popup will appear, select your project DLL from bin/debug folder of the project. After selecting DLL, make sure that the Select All is selected in Step 2. 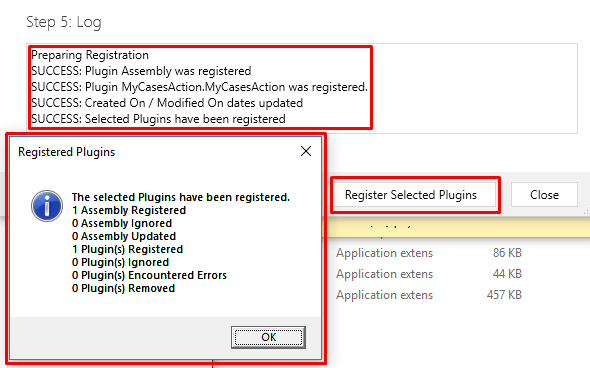 Leave the rest of the options as they are and click Register Selected Plugins, it should register your assembly successfully. You can verify the assembly after registering in Plugin Registration Tool. 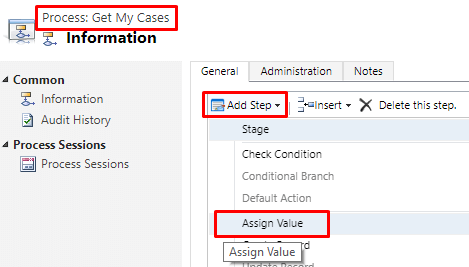 Go to the Solution, create a new process, set name as “Get My Cases”, set category as “Action” & in the entity, I’m setting it as “None (global)”. If we will select some entity here, our action will get one default input parameter of the same type as given entity. 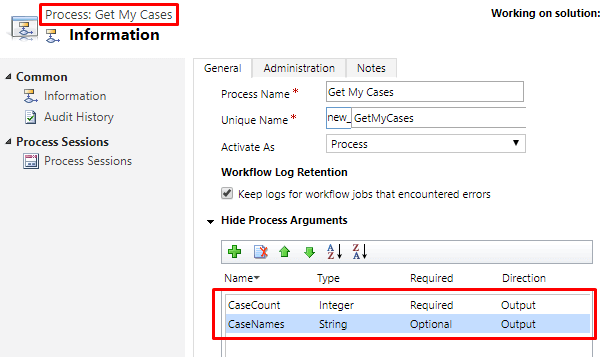 Add two output arguments with the same type as output parameters given in MyCasesAction class. However, the names do not need to be the same but you can keep them the same to avoid confusion. 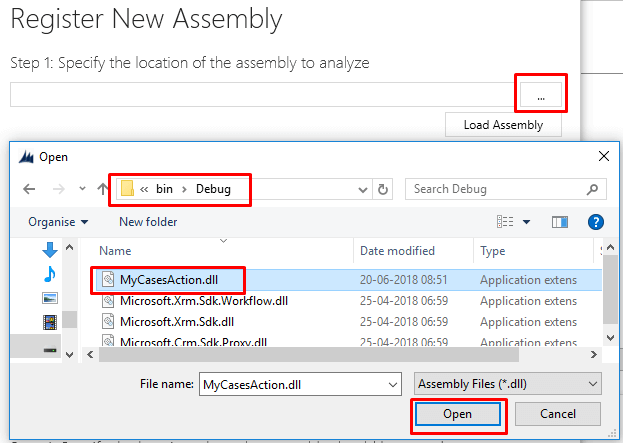 Click on "Add Step" and look for your assembly; i.e MyCasesAction. Click on it and select MyCasesAction.MyCasesAction step. The step added from assembly will return case count and names, which should be set to output arguments. Add “Assign Value” step for both arguments. Click on “Set Properties” in Assign Value to set output argument value. Do it for both “CaseCount” & “CaseNames”. 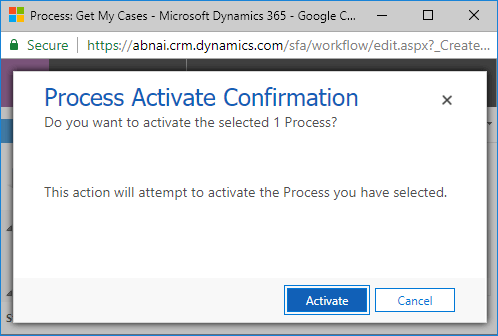 Save your process and click on “Activate” to activate it. It will ask for confirmation; click “Activate” to confirm. You need to grab Unique Name/Logical Name of your process, which is id new_GetMyCases in our case. 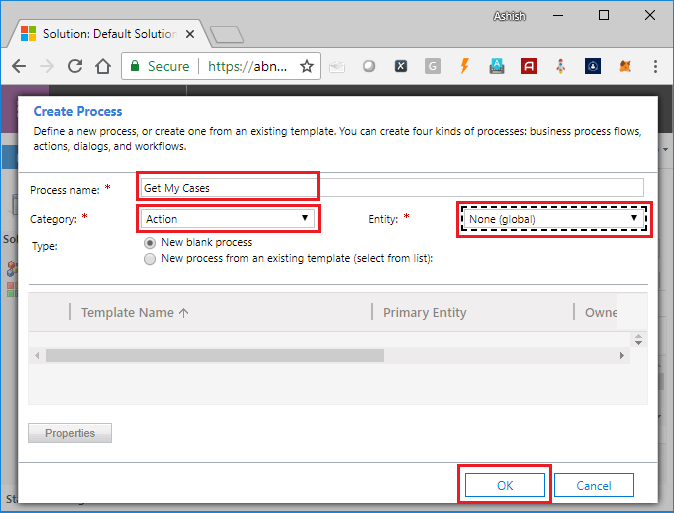 Run the above code to test and verify your custom action.